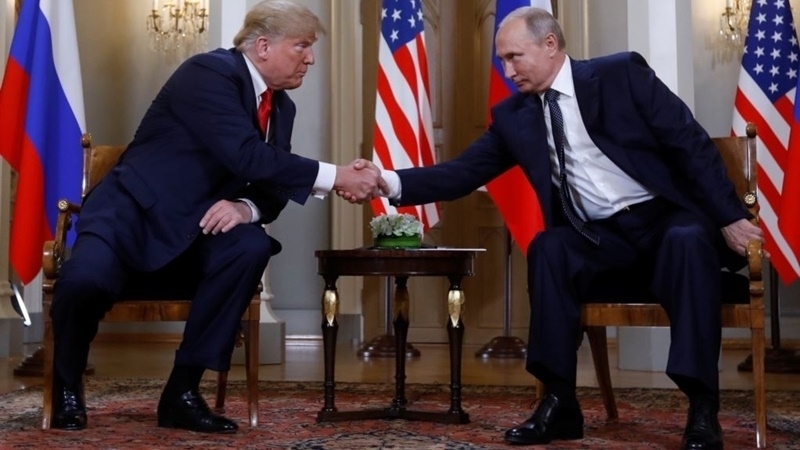 During the meeting in Helsinki, Russian President Vladimir Putin invited his American counterpart Donald Trump to hold a referendum in the Donbas, Bloomberg reports, citing its own sources. According to the publication, Putin at a closed meeting with ambassadors of the Foreign Ministry said that he had voiced the idea of holding a referendum in unrecognized "LPR" and "DPR" regarding the status of the territories. Allegedly, the Head of the Russian Federation gave Trump time to consider the issue, before reporting it publicly. The Kremlin spokesmanDmitry Peskov refused to comment on the information, saying that "Some new ideas were discussed. They will be worked on." The publication notes that Putin suggested a vote conducted under international auspices by the residents of the separatist territories on their status. "While Putin portrayed the Ukraine offer as a sign he’s seeking to bring the four-year-old crisis to an end, a referendum is likely to be a hard sell with Ukraine and its backers in Europe, who remain committed to an 2015 European-brokered truce deal for the Donbas region, parts of which are controlled by Russian-backed separatists,” the article says. Meanwhile, it became known that Trump invited the Russian president to the United States. Trump's spokeswoman Sarah Sanders informed that Trump is expecting Putin in the fall of this year. “In Helsinki, President Trump agreed to ongoing working level dialogue between the two security council staffs. President Trump asked John Bolton to invite President Putin to Washington in the fall and those discussions are already underway,” she reported. Earlier, the Head of the Mejlis of the Crimean Tatar people Refat Chubarov said that with his behavior and remarks, the American leader almost encouraged Putin in his discussions on the issues of relations between Russia and America. Chubarov also reproached Trump for ignoring the issue of political prisoners in Russia at a meeting with Russian President Vladimir Putin.